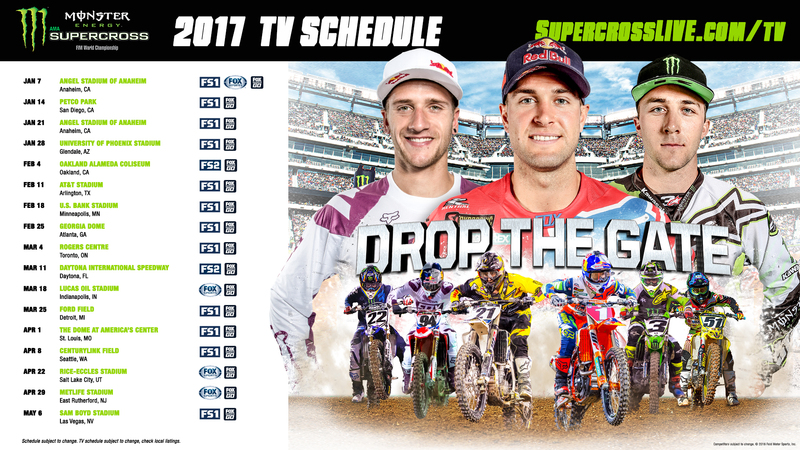 The 2017 Monster Energy Supercross TV Schedule was released by Feld Entertainment. Fox Sports will provide broadcast coverage of the entire season, which begins January 7 in Angel Stadium, Anaheim, Calif., and ends May 6 in Sam Boyd Stadium, Las Vegas. Fox Sports GO app will also provide coverage for computers and mobile devices, and Monster Energy Supercross pay-per-view livestream is available at SupercrossLIVE.com. Heading into Monster Energy Supercross, and FIM World Championship, Red Bull KTM’s Ryan Dungey will have the #1 plate. The KTM 450 SX-F pilot claimed his second SX title last year after finishing on the podium at all but one race, including nine wins. It still wasn’t a runaway 450SX season, though; Suzuki’s Ken Roczen (now on Honda), Kawasaki’s Eli Tomac, and Husqvarna’s Jason Anderson provided some serious fights throughout 2016 Supercross. In the 250SX class, Honda’s Malcolm Stewart won the East title, and Yamaha’s Cooper Webb the West title (Check out our exclusive interview with Webb). Feld Entertainment will also debut the Monster Energy Supercross 2017 Preview Show on on FS1 at 5 p.m. ET Friday, December 18. This unprecedented, unfiltered look into the lives of Ryan Dungey, Chad Reed, Ken Roczen, Eli Tomac, Marvin Musquin, Jason Anderson, and Cooper Webb chronicles preparations before the elite riders go head-to-head in the quest for their place on the podium. Previous articleMotorcycle Superstitions Exposed | What Are Yours?